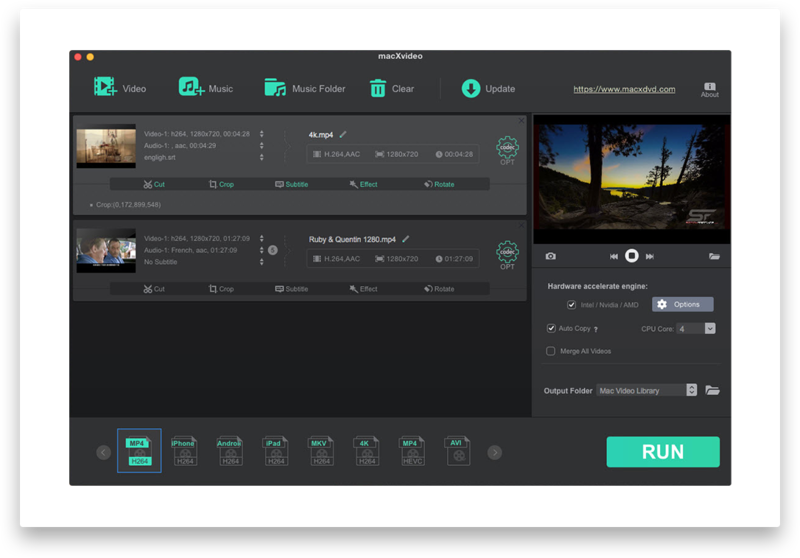 macXvideo is a free video processing tool designed for 4K, 5K and 8K Ultra HD videos. It provides an easy, stable and reliable way to edit, compress, transcode, create and share 4K videos. With a bunch of features that are on par with a editor built in the most intuitive interface, everyone can make amazing movies in no time! The unique 4K engine promises the speed, output quality and low bit rates, an essential video helper for all 4K & HD video buffs. With support for 370+ video/audio codecs, it accepts any video, including 4K HEVC, ProRes, XAVC, AVC, HD, SD videos. Flexible editing options are at your fingertips to trim, merge, rotate, cut, split, control video/audio speed, adjust audio volume, adjust display etc. The large effects library will give even the most amateur videos a professional look, including grayscale, vignette, mirror, noise, negate etc. With all features conveniently placed, even the most novice user can start editing immediately. Video and audio converters are great tools that comes handy when you have to convert their file formats. Great tool.